Travel allows us to see and experience places foreign to us, giving us new insights and enhanced cultural awareness. Wanderlust is a widespread epidemic. Whether you’re jet-setting, hitting the road, or anything in between, planning for the trials and tribulations of travel is crucial for an easygoing experience. Are you headed on a trip soon? Here are some uber useful DIYs to set you off on the right foot. Dehydration is a major side effect of travel, especially in airplanes. Lotion makes battling dry skin an easy win, and this DIY version has the added relaxation benefits and soothing scent of lavender. You can eliminate the risk of a lost waterproof camera with an easy-to-make camera float made from a few simple supplies. You can cut the foam pool noodle down smaller for a more compact version. Losing keys on a getaway is a quick way to ruin your trip. A big keychain will help you keep track of them. Plus, this DIY keychain floats for easy recovery in aquatic accidents. Passports are a must for international travel. They can often be difficult to find when rummaging through your pack in the customs line, but this handy leather cover will make it easy to spot. 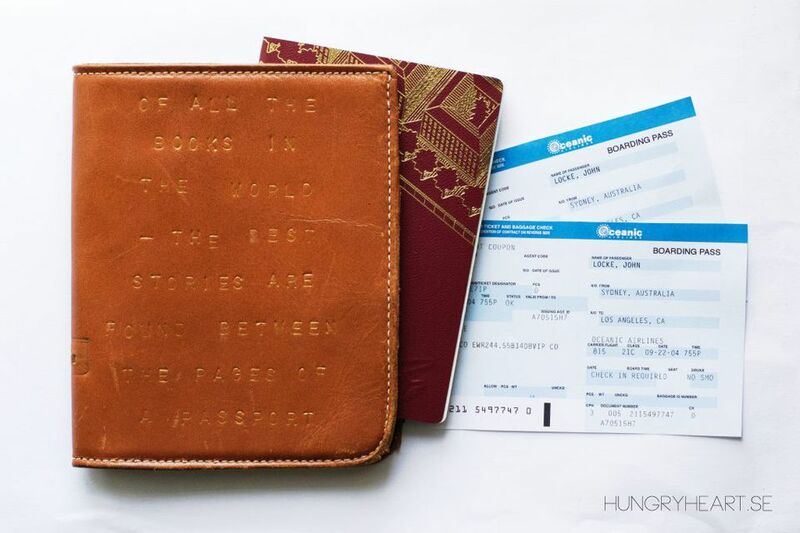 Use leather punches to personalize it with your favorite travel quote. Do you tan, burn, or a combination of both? If sunburn is an issue, aloe vera is a must-have. It’s soothing feel and medicinal properties make it the perfect remedy for a suntan gone wrong. With this DIY, you’ll never have to fret about jet lag again. Keep sunlight out and sweet dreams in with this easy sewing project. Sunglasses can easily get scratched or broken in a crowded beach bag. Your favorite pair deserves protection and this tutorial is here to help. Keep track of all the little details of your journey with a travel journal. You can read them later to reminisce on a trip well spent. Pick out a fun notebook and use these ideas to fill it with memories. Long flights, train rides, and road trips are not your body’s friend. They often lead to an unwelcome amount of aches and pains. Consider taking a travel pillow for neck support on your next adventure. Instead of shelling out dough for one at the airport, try this DIY one ahead of time. SPF is imperative to healthy skin and should be a staple in everyone’s skincare routine. Travel often means long days outdoors, making SPF even more important. And yes, your lips can burn just like your skin. They need SPF care, too! If you’ve ever lived out of a suitcase, you know how quickly your clothes become disarrayed. This DIY laundry bag will help you on a mission to organize. Anything can happen on a trip, including accidents. This handy kit fits easily in your travel bag and will arm you with the tools you need to face mishaps. Hydration, hydration, hydration–we can’t say it enough. Drinking water is important in daily life, and crucial during travel. Trips typically involve lots of walking and time outdoors, two activities your body needs water for. These cute hand-lettered bottles will make hydration on-the-go a breeze. Keeping snacks handy will save you money, time, and frustration–trust us. Sew these beauties and fill them with your favorite munchies to get you through the day. This space-saving DIY will up your packing game. No more loose toiletries in your bag! Traveling can be harsh on your hair. You won’t have to waste any of your precious time fixing it up after you make this bow scrunchie. Organization is a travel lifesaver. Instead of rummaging through your bag to find the specific cord or device you need, make this stylish leather cord wallet to keep things in the right place. Pics or it didn’t happen. But seriously, an exciting trip is nothing without proper documentation. What better way to photograph your adventure comfortably (and fashionably) than with this DIY scarf camera strap? The therapeutic nature of painting is almost necessary on painstakingly long trips. If you have an old altoid tin, you can make this watercolor kit and practice art anywhere. Kids and travel don’t always mix well. These “busy board” ideas are sure to keep little ones occupied for hours. We love a multi-tasking item for travel. They save valuable luggage space and function just how you need it. This scarf can be used for warmth on chilly flights, worn as a fashion-forward accessory, and even a used as a picnic blanket. Traveling light makes trips so much easier. The concept applies to everything, even your wallet. You don’t need to buy a new slim travel wallet, you can customize your own for a few bucks with this tutorial! Identifying your luggage as it rolls by on the baggage claim carousel just got a whole lot easier. Use your favorite colorful washi tape to personalize your suitcase handles and easily spot your bag. Experiencing new places often comes with extra allergies, or (knock on wood) a cold. Come prepared with a handmade tissue holder. Travel is practically synonymous with reading. It’s the perfect relaxing activity on beach bum days or long plane rides. Make this fun tassel bookmark to keep your spot!